This short piece can be no more than a sketch of a subject which, by its very nature, is fluid, indefinable and endless. The aether is of a pre-physical era in the evolution of the cosmos. So thinking about it and trying to attune to it requires a different kind of consciousness from the point-centred out-look of incarnated individuals in the physical-material world. This is easy to say, but not so easy to put into practice. For example, instead of singular, exclusive points of view, aether awareness involves an all-round, all-inclusive planar view from the periphery of the pulsating cosmos, from which one can then home in and focus on any particular situation. However, treating such major adjustments as simply intellectual exercises can result in a superficial, mystical, fantasy-like state of mind – which may be pleasant for a while, but will lack a sense of grounded connection with the Earth, and will probably soon dissipate. A certain amount of acclimatising is required – as when surfacing from deep water. To merely peep out from a materialistic ‘mind-box’ will not satisfy the truly curious mind. However, going beyond that mentality involves growing out of our present limitations – like adolescents, no longer dependent and relishing our independence, yet beginning to realise there’s a whole lot more to being an adult than merely indulging in individualistic pursuits. The aether’s ‘beyond-ness’ is experienced in its presence as the invisible, dynamic reality behind and permeating the physical realm of matter and discrete objects. By inferring this vital presence, some coherence can be brought to the scientists’ fragmented and disjointed world of ‘building blocks’, standardised particles and abstract units of quantity. In this respect, the aether is a transitional state between that realm and the unity or ‘no-thing-ness’ of pure consciousness. The following includes several spontaneously spoken, as opposed to written, quotes, mostly drawn from live recordings of discussions with scientists and others, later transcribed. Awareness of the aether under different names, and ideas about it, go back into the farthest reaches of human history. Aether comes from an ancient Greek word, and one of its many meanings is: ‘the substance that permeates the cosmos from which the stars and planets were made’. It also signifies a blazing, the heavens, shining light and the upper atmosphere. Sambhoga-kaya, an ancient Tibetan term, refers to the intermediate stage in the emerging of the cosmos. From the nothingness or unity state emanated radiant light, which then evolved into this physical universe. Indian and Chinese culture have various names for different aspects of the Aether. In the Hebrew Old Testament it’s referred to as the ‘cosmic waters’. Quintessence, which literally means the fifth essence or element, is another ancient term, recently re-introduced in modern physics. It refers to the subtle, indefinable, universal something that pervades the whole cosmos. Sir Isaac Newton knew and wrote about the aether and about a universal expansive force which used to be known as levity, and is the complementary opposite of gravity. Gravity and levity are the two polar forces of the aether, and thus of the universe. In more recent times, Einstein, in 1920, explicitly affirmed the existence of the aether. He said, ‘There is nothing in Relativity that discards an aether.’ One eminent physicist, David Bohm, seemed very close to the idea of the aether when he proposed a non-physical realm of potential manifestation. This he called the implicate order, which exists as the middle level of a three-level system. And another well known contemporary scientist and writer, Paul Davies, has suggested the concept of a quantum ether. So with numerous signs of the aether being acknowledged again under various other names, and despite various authoritative dismissals over the years, the aether has never gone away. Sir Isaac Newton was the first Western scientist to identify gravity and put it on a scientific and mathematical basis. As a man deeply interested and involved in spiritual and occult knowledge such as alchemy, he also covered a lot more ground than the Western science establishment has been prepared to acknowledge. And this included his writings on the polar opposite of gravity, the universal expansive force, known in earlier times as levity. Nick Thomas, independent scientist and mathematician, has said: “You can have this notion of a force in the cosmos that’s drawing away from the centre rather than towards it. And there’s a lot of evidence that such a force exists in the cosmos now.” Thus we can appreciate levity directly when we see heat rising as in a flame, trees reaching ‘upwards’, or when we experience a sense of elevation in our upright posture. It was around Newton’s time that the Accademia del Cimento in Florence, then a world authority on scientific matters, issued a paper entitled Contra Levitatem which decreed that science should no longer recognise levity as meriting equal rank with its opposite, gravity. The historical context was that of a newly emerging discipline of scientific enquiry which was trying to be ultra-objective, unlike religion, and focused solely on the physical, as opposed to anything which was reminiscent of mysticism or the Church. It seems the idea of levity, as the opposite of gravity, was felt to draw people away from a physical earthbound mentality towards a more transcendental, aethereal state. At a stroke this denial of the principle of polarity prevented any balanced scientific enquiry into the nature of gravity. And it helped distort Western science into making a false distinction between the physical, as what is ‘real’, and the non-physical, thereafter to be considered ‘unreal’ and so not worthy of scientific investigation. So although, in its historical context, it can be seen to have had some justification, its consequences have echoed on way beyond their useful time. Within its wholeness, the aether can be seen to consist of four distinct grades or qualities. These are known as the Warmth Aether, the Light Aether, the Tone or Chemical Aether and the Life Aether. They correspond to the four traditional elements, Fire, Air, Water and Earth, and fit in with several other four-way views of the world, such the traditional humours, temperaments, the compass directions and the four states of matter, including heat or plasma. The ancient Eastern concepts of Akasha, and the Akashic Record which refers to a kind of cosmic memory bank, are part of the consciousness aspect of the aether. Included in this would seem to be what some call the Platonic world, a realm of ideal, archetypal forms such as the perfect circle and square – forms which don’t exist in physical Nature. It’s named after the Greek philosopher, Plato, who lived in a much less materialistic era than ours. Consciousness, meanwhile, remains the ultimate mystery for materialistic science, its Holy Grail, some would say. Materialists claim that consciousness somehow arises from matter, a line of thinking leads to a picture of a haphazard, meaningless, fragmented universe. And aether awareness is not some kind of ultimate store of knowledge, but does extend and clarify our experiences, setting them in a greater context, enhancing every area of our lives. (b) there are two natural colour spectrums, not just the one. Colour, the subjective, qualitative experience of colour/tone – as opposed to objective, quantified, vibratory ‘frequencies’ – is the result of pure, invisible* light energy becoming physically visible through its interaction with matter, whether that matter is electric/atmospheric plasma, gaseous, liquid or solid. Its progress in penetrating through matter is impeded and slowed to varying degrees, depending upon the density of the medium. This results in the graduated visible light spectrum. * Professor of physics, Arthur Zajonc, describes a simple demonstration of the invisibility of pure light energy on pages 2-3 of his book, Catching the Light. He also expounds the richness of Goethe’s dynamic, qualitative approach to the polarity of lightness and darkness, in contrast to the narrow, mechanistic, quantifying approach of most Western scientists. Goethe, as a matter of principle, always started his scientific investigations by observing phenomena in their natural conditions, insisting that universal scientific principles or ‘laws’ of nature cannot be established on the basis of observations made under artificial conditions. He was also very sensitive to the universal principle of polarity that governs all of nature – as indeed was Sir Isaac Newton who referred to the polar opposite force of contractive gravity, ie expansive levity, as the universal expansive force. Type 1: A rainbow appears when light energy radiating from the sun penetrates the Earth’s atmosphere – which ranges from outer rarity to inner density – under certain contingent conditions. These include direct sunlight, airborne moisture and particular angles and distances. The incoming light energy is ‘framed’ between the edges of the ‘window’ formed by the polar opposite rarity/density and darkness/lightness extremes of the Earth’s atmosphere. This phenomenon can be paralleled in a small scale experiment by setting up a prism to have a similar effect, as Newton ingeniously demonstrated. However, the conventional interpretation of this observation – that it demonstrates ‘white light’ to be ‘composed’ of a spectrum of colours – is flawed. In simple terms, the primal invisible light energy is impeded by the medium of air and/or the prism, slowed and graduated into the visible colour spectrum of red through green to violet. Type 2: Imagine the same rainbow situation but viewed from a perspective directed inwards from out in the cosmos way beyond Earth’s atmosphere – from the zone where the dense physical-material world of predominating gravity fades into the pre-physical realm of predominating levity, which extends outwards and beyond. The physical planet Earth would form a dense, dark, gravity-bound mass, obstructing the passing of the sun’s light energy, but in a polar opposite way to the ‘window edges’ effect. As the light passes the outer ‘edges’ of the obstructing Earth and is thereby graduated, the dark, centric shadow created – given certain contingent conditions, angles and proportionate distances – becomes visible as the colour magenta, at the centre of a spectrum with red, orange and yellow (towards green) on one ‘side’, and violet, indigo and blue (towards green) on the opposite side. This phenomenon can also be demonstrated using sunlight and a small scale set-up of a prism, a plain screen and a thin short rod (eg 2-3mm wide). The rod, held in front of the middle of the central green area of the ‘red to violet’ spectrum, forms a central shadow which, at the appropriate position/distance, becomes the magenta centre of a ‘blue-to-yellow’ spectrum which merges at its extremes into the surrounding green. Thus the existence of two polar opposite light spectrums is demonstrable, according to which of the alternative ‘edge’ conditions prevails. So, the physical-material realm exists within, ie is surrounded and permeated by, the magenta zone at the mid-range level of the pre-physical spectrum, which extends beyond the vibratory range of the physical-material realm. Thus between the pre-physical and the physical-material realms is the magenta border/interface/zone, aka the Threshold. The two spectrums each indicate a range of vibrations and velocities of light energy as it penetrates Earth’s atmosphere – faster in the outer rarity, slower in the inner density. Therefore, there is no constant velocity/speed of light – just as there is no constant ‘speed of air’ when it surges into a partial vacuum, in an environment of varying atmospheric pressure, fills it and is thereafter simply dynamically present as a form of energy. This raises crucial questions about the validity of the iconic equation E = Mc2, a topic addressed from the Threshold perspective elsewhere. (b) the physical-material world where gravity/contraction is predominant. The pre-physical realm, also known as the (a)ether, quintessence or quantum vacuum, functions in D2D space, and not in physical, static, box-like, 3D space. Therefore, care has to be taken not to mistakenly apply 3D physical space-time thinking to pre-physical D2D conditions and phenomena. Here’s an excerpt from my online ‘paper’, The Primal Code, that’s been around since 2006. It has been read by various professors and teachers of mathematics, scientists and others, and has not been refuted, despite open invitations to do just that. The problem for these learned people seems to be that The Primal Code starts from a broader perspective than that of current conventional mathematical thinking, and only later homes in on the numbers themselves to resolve the mystery. With most mathematicians I’ve encountered, this has resulted in a judgement that it’s ‘not proper mathematics’, and therefore not worthy of serious consideration, even though it delivers a sound, consistent and clear resolution to a previously unresolved enigma. It works like this. Three simple axiomatic principles are posited which govern how the cosmos originated and continues to function. As such, these are fundamental to all thinking, including mathematical thinking, in the broad sense of its Greek root word ‘manthanein’ which means ‘to learn’. The three principles are outlined in Notes from the Threshold, available online as a free download from www.pathwayinitiatives.co.uk. The third of these principles is resonance which connects Pythagoras’ Harmonic Series with Euler’s discovery of (a) the basic mathematical zeta function and (b) how the prime numbers connect the functions of multiplication and addition. So the work of Pythagoras and Euler together link resonance with the primes. The Primal Code is not concerned with calculating probabilities or mathematical proofs, since these necessarily involve various questionable assumptions integral to the discipline as it currently stands. Instead, it offers a concise and logically consistent line of thinking which delivers the required numbers in a coherent, clear and systematic way. And just for clarification, this work is not based on any religious or mystical beliefs. All it requires is an open minded, non-dogmatic attitude and a little perseverance with what at first may seem an unfamiliar way of thinking. Cover blurb of The Music of the Primes by UK professor of mathematics, Marcus du Sautoy (2004). Mathematician Prof. Don Zagier speaking of the primes, quoted in The Mathematical Experience by Philip J Davis and Reuben Hersh (1981). 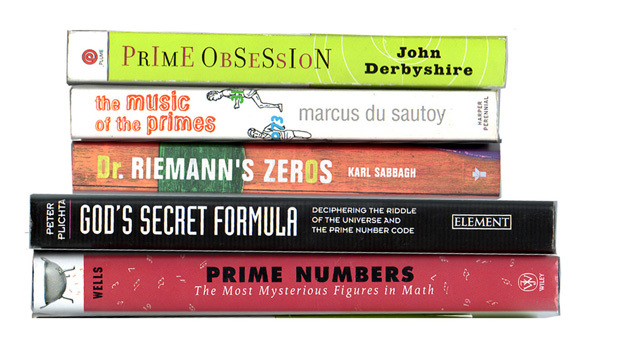 Prime Numbers – The Most Mysterious Figures in Math. Title of a 2005 book by mathematician David Wells. God’s Secret Formula – deciphering the riddle of the universe and the prime number code. Title of a1997 non-fiction book by scientist Peter Plichta. Title of a 2003 book about the prime numbers by mathematician John Derbyshire. These few quotes are included simply to illustrate the continuing fascination after many centuries, particularly of mathematicians and scientists, with the prime numbers. The books reveal how each author seemed intuitively to sense something very special which inspired his book. Yet none was able to grasp what actually makes the prime numbers so significant. The primes are also central to the Riemann Hypothesis and the Goldbach Conjecture, two other longstanding and unresolved conundrums of mathematics. Albert Einstein made the wise observation that “No problem can be solved from the same level of consciousness that created it”. This one can only be resolved by starting out from universal cosmic principles beyond mathematics, and then homing in on the world of numbers, or working from those numbers to the principles. Central to this work is the idea that the very sequence of the prime numbers constitutes a Primal Code of values which is fundamental to understanding how the cosmos was and continues to be formed. In this bigger context, a universal coherence can be appreciated, certain mathematical problems, previously considered unresolvable, can be resolved and various special numbers, called ‘irrational’ by mathematicians, can be seen as rational. Since the approach taken here is by no means an orthodox mathematical one, it does involve questioning some perhaps previously unquestioned assumptions. Embedded in normal mathematical practice for many years, these would seem to have been contributing to the problems all along. In the 1930s, mathematician, Kurt Godel, established that there are statements which cannot be proved true or untrue within the axioms of a mathematical system. For a mathematical ‘proof’ only has meaning within the limited definitions, rules and conventions of the language of mathematics. So meaning cannot be found in numbers themselves, although patterns of order amongst them obviously can and may imply meanings. It’s also assumed in this work that there is a coherent order behind what’s normally called randomness, a concept that covers up the human inability to handle certain degrees of complexity arising out of the basically simple cosmic principles underlying that order. An understanding of the pattern and meaning of the prime numbers sequence has eluded mathematicians for over 2000 years, and since 1859 no one has been able to prove or disprove the Riemann Hypothesis. The Goldbach Conjecture, about a self-evident fact regarding even numbers and the primes, has likewise remained unproven since 1742. So questions inevitably arise concerning the assumptions behind the thinking of all those striving to resolve these three related enigmas. That is to say, these problems have to be viewed in context from outside the mathematician’s mindset, from outside the box, with questions more of a psychological than a strictly mathematical nature. 1. Universal Consciousness (UC) is the original animating principle of the void/vacuum of no-thing-ness, an idea beyond the limited capacity of individual, incarnate human consciousness to comprehend fully. UC is axiomatic to this work since it’s what accounts for humans, individually and collectively, being able to think about such abstract subjects as mathematics. 2. The second and third universal principles, polarity and resonance, account for the coherent order that prevails throughout the cosmos, behind all superficial disorder. 3. Zero has two complementary, polar opposite meanings, both of which carry the sense of a threshold which itself has no substance or numerical value. Big zero is the periphery where finite ‘somethingness’ and the infinite ‘nothingness’ interface. Little zero, as a number symbol, represents those points, gaps or spaces which serve as portals into the same infinite nothingness. That theme will be developed later in this work. Beyond zero is the so called ‘negative’ realm of potential/virtual values, the great void of no-thing-ness, aka the fullness of pure energy. 4. The number One serves as both the biggest and smallest number: the all-inclusive, total unity and its polar opposite, the exclusive, single unit. Two Greek words: khaos (chaos) implies a potential, pre-physical order in the void, womb, matrix, cauldron (the negative), while kosmos (cosmos) means a worldly order (the positive). This refers to the continuous cyclical process of manifestation from the pre-physical state of chaos into the physical-material state of cosmos, followed by redemption and so on. 1. It all starts with UC, the void, full of potential, within which is created a focal point, a singularity. That point becomes the centre around which an expanded sphere instantly forms, ie a pre-physical sphere of potential manifestation, a one–ness, an order, a cosmos. 2. The symmetry of this sphere is distorted like a bubble by uneven ‘external’ and ‘internal’ forces. The resulting asymmetry accounts for the various natural, archetypal forms and shapes. Consideration of the primal forces involved is beyond the scope of this work. 3. As universal consciousness tends towards re-establishing its original unity state, a rhythmical, pulsating dynamic of two polar opposite forces arises between periphery and centre, inwards/outwards, an order of two-ness within the one cosmos. This dynamic 2–dimensionality, D2D, is a key concept regarding the currently evolving mathematics of the Threshold. 4. The interaction between the polar opposite forces of (a) inward contraction (gravity creating density) and (b) outward expansion (levity creating rarity) generates a primal, pre-physical potential, a dynamic, ie basic, raw ENERGY. 5. The interface, the threshold where these two forces meet and balance out, establishes three-ness from the two forces in the one cosmos. This threshold can be imagined as a spherical standing wave, transient but enduring so long as the two polar opposite forces maintain their dynamic, rhythmic state of balance. 6. The threshold standing wave, a concentric sub-sphere within the original sphere of potential manifestation (the cosmos), also constitutes a resonant cavity. 7. Within it, repetitively, further sub-spheres are formed in accordance with the principle of harmonic resonance, which the acoustical Harmonic Series of Pythagoras demonstrates. 8. Towards the centre point, the increasing density of concentric sub-spheres impedes the rhythmically pulsating energy until eventually some becomes trapped, frozen or ‘woven’ between the densely packed sub-spheres closest to the centre. 9. Here matter is created, ‘woven’ through the interplay of the inward/outward movement (weft) and the standing wave inertia (warp). The process passes through the four states of matter – from the rarest, transformative, fiery plasma, through the gaseous and liquid, to the densest inert solid. These four states correspond to the four traditional archetypal elements of fire, air, water and earth. 10. When the original universal consciousness, as primal energy, cools, contracts and sinks (‘descends’) into dense solid matter, disintegration and fragmentation occur. Discrete bits of material substance form within the previously continuous fluidity, like lava. 11. Meanwhile, individualised, earthly human beings have been evolving through a pre-physical, aethereal state into physical-material embodiment, and begin to use, compare, standardise and measure material objects in an embryonic mathematical way. 12. The now individual, point-centred consciousness of incarnate humanity, deeply embedded in matter, gradually evolves the capacity for detached, abstract thinking, ie able to disconnect from its immediate physical circumstances. That enables a way of quantifying to develop, applicable to all aspects of the physical-material world: an equal measuring unit (EMU) system of standardised quantities, and an EMU number system. This very useful but artificial device does not truly reflect the dynamic continuity of Nature and the cosmos. It requires a kind of suspension of disbelief, like the cinematic experience of ‘seeing’ a series of still pictures as if moving and alive. It has, however, now long dominated and distorted humanity’s conception of what might be ‘real’, true or factual. One pathological consequence of this is the current epidemic of sterile, ‘objective’, dead (static) statistical thinking. This excludes the living dynamics of will and feeling, ie pro-active consciousness, from all calculating, analysis and projecting into the future. (a) Further inwards leads ‘through’ the centre, the inner infinitude or vanishing point of density and smallness. That means penetrating beyond the atom (the Greek word ‘atom’ means an indivisible entity), and beyond the so called quantum level (‘quantum’ means the smallest discrete quantity of physical energy). This ‘passing through’ the cosmic centre point results in a ‘re-emergence’ into the non-quantifiable, continuous pre-physical realm. Physical science, having not yet realised this, still uses the materialistic terminology of fragmented, separate particles etc in its endless categorising and quantifying. (b) Further ‘outwards’ leads directly to the peripheral infinitude of rarity and vastness, ie into the pre-physical realm and the unlimited void of UC. Astrophysicists and cosmologists search in this direction, but also still seem locked into the terminology of the physical-material world – while allowing themselves a little imaginative poetic license here and there, such as in curved space, event horizons, black holes, dark energy and so on. A new mathematical language has long been required to deal with the pre-physical realm, given it’s qualitative difference from the physical-material realm from which the EMU system emerged. And, as will become clear later in this work, certain improvements to the currently conventional number system are required. 3: three-ness is present at the Threshold between the two forces in the one manifested cosmos. In the pre-physical realm there are no discrete, separated parts – only an ever changing continuity of different qualities, forces, tendencies etc. This would seem to be what has confounded many who have delved into the so called ‘quantum’ world. So, mathematically, you can start from one as a whole inclusive unity or from one as a partial exclusive unit, all within the greater nothingness. To divide up the wholeness, the unity, into a number of equal portions is to multiply the quantity of units by that same number. So the universal principle of polarity finds mathematical expression in, for example, the reciprocity of division and multiplication. The process of manifestation into many-ness is one half of a two part cyclical process, the other half being the polar opposite complementary process of redemption back into the original state of oneness/nothingness – ie the general idea of entropy. So, one whole cycle consists of two phases (inward and outward), each of which consists of three stages. That makes six stages per cycle. This can be considered multiplication: oneness producing two-ness producing three-ness, or addition: a state of simultaneous oneness plus two-ness plus three-ness. Whether 1, 2 and 3 are multiplied or added together, the result is 6, product or sum. This special property is unique to the number 6 which is thus known as a perfect number. Pythagoras’ Harmonic Series connects resonance with the mathematics of ratios, while Euler’s discovery of the basic mathematical zeta function coincides with this. Euler’s Product also demonstrates how the prime numbers connect multiplication and addition. So the work of Pythagoras and Euler together link resonance with the primes. As these series progress, each new number/resonant cavity that is a multiple of (ie resonates with) an already established prime is automatically subsumed by it, has no independent resonant identity of its own and so is cancelled out, eliminated. That leaves only those RCs that resonate solely with the original one cosmos and those numbers which are only divisible by one, ie the prime numbers. Artificially merging the two arithmetic progressions gives us the familiar sequence of prime numbers, which previously appeared to be ‘irrational’. These are, in essence, a series of ordinals to which the cardinal prime numbers correspond in the Primal Code. sub-spheres/resonant cavities in resonance solely with the original. corresponds to the acoustical/musical Harmonic Series of Pythagoras. The Harmonic Series coincides with Euler’s Zeta Function (when the exponent x = 1). The Zeta Function (when x=1) is an infinite series. (lowest) tone being that of the original one resonant cavity. while all other EMU numbers can be reduced down to combinations of primes. (b) those EMU cardinal prime numbers only divisible by (ie resonant with) the number one. 2. Mathematically calculating a specific series of EMU cardinal numbers. (b) how much time and resources anyone is prepared to devote to this infinite quest. The primes, expressed as EMU cardinal numbers, represent an ordinal scale of markers of the cosmic formative process – from the potential pre-physical realm to the realm of actual physical forms – expressing the principles of polarity and harmonic resonance. So the primes can be understood as a primal cosmic number system, a Primal Code. However, when seen only from the physical-material perspective of the EMU number system, no logical order is apparent. Hence their 2000+ year ‘enigma’ status. The fact that this account is not wholly reducible down to a concise formula, algorithm or a formal ‘proof’ affirms Godel’s Incompleteness principle and emphasises that the significance of the primes extends beyond the limits of current mathematics. One idea for extending mathematics beyond this present limitation would be to introduce a new mathematical resonance symbol (ie stating ‘is resonant with’), as proposed in Threshold Mathematics. Also, to ignore the subtle, underlying pattern and the greater cosmic context, in favour of a narrow, arithmetic definition of what constitutes a prime number, would be to repeat the failure over the last 2000+ years to appreciate the significance of the natural order of the primes. Thus the enigma of the distribution of the prime numbers is resolved by the Primal Code. From the Threshold perspective, certain so called irrational numbers can be understood as rational Threshold numbers, since they regulate or scale the transformations between the pre-physical and the physical-material realms – serving as a kind of constant exchange rate. They represent constant scaling values of proportion or ratio between the two realms which, being qualitatively different, function according to different ratio-nales.